Hi Yz Kid, welcome to the site. I'm almost 11 yrs old and I ride a crf100. I really really want a CRF150RB. I rode one and really like it. We ride mostly desert. Do you only ride tracks? What is AZ like? I've never been there. Oh, I rode a CR85 once (2 stroke) and I LOVED it. Loved the power, it was very different than my 4 stroke. That sounds a lot like here. I have go to bed now ...talk to ya later! thanks bro. why didnt you like the kx 85? too much power? 150's are fun too i rode my friends a while back. there is a track out here i have heard about called kingman motoplex and supposebly it is a really good track. i will let you know more when i go. Nice Bike have to say that 85's are one of my favorite bikes to ride. 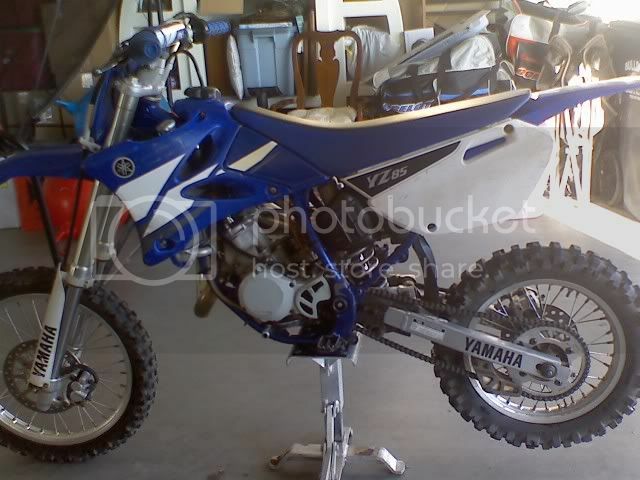 All of my friends use to have 85's and they all enjoyed riding wheelies past me in 6th gear. They are little rippers. You'r not lost until you run out of gas. I'm also new to the crf's only message board. I am a crf rider. My 1st bike in 2005 was a crf50. Now, 4 years later I am 12years old and back on a crf. Yesterday I got a 2008 crf150r small wheel!!!!!!!!! I've only rode it in my backyard for about 5 minutes and I LOVE IT!!!!!!!!!!!!!!!!!!!!!!!!!! !